As we approach the 2015 holiday season, Congress has completed its work before going on recess until early January. December 2015 was a period of significant federal policy development on a range of issues important to our clients and friends. The Paris Climate Summit that recently concluded. Van Ness Feldman’s Kyle Danish wrote a timely analysis which is appended in the link, here. We also want to draw your attention to several important trends that are likely to continue into 2016. 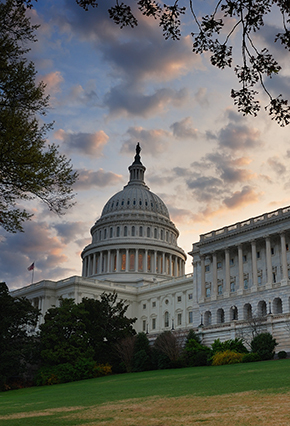 The Omnibus Appropriations legislation, which was adopted by Congress today, not only funds the government through the end of the current fiscal year (September 30, 2016), but also contains a number of policy provisions on a wide range of subjects. Perhaps the most notable of these provisions is the repeal of the forty year ban on oil exports. The Tax Extenders legislation, which was also adopted by Congress today, extends a wide range of tax benefits for two to five years each. The President is expected to sign these two packages into law in the next few days. Finally, the long awaited Transportation Bill, which was signed into law December 4th by the President, reauthorizes and funds transportation projects for the next three fiscal years and establishes new policy on a wide range of issues, including energy issues, not all of which are strictly related to transportation projects. These three legislative packages provide for major changes in federal policy affecting industries, states, municipalities, and many other interests. The fact that legislation was enacted is significant enough to matter to most in the country, but it is worth looking into the legislation further to understand where federal legislation, and the programs it governs, is moving. Early in 2016, we intend to provide analysis of the new policies adopted in December through these bills, and other policy development mechanisms, and to provide our view of what lies ahead in 2016. The “big bill” method of legislating is perceived to have some significant draw backs and can be particularly worrisome to budget conscious Members of Congress. These bills come together at the “last minute” in Congress when the normal method of legislating has failed. The legislation is normally voluminous –in the case of the FY 2016 Omnibus Appropriations bill, 2009 pages of legislative text. Members are given very little time to learn what provisions are contained in the bill and the bills are usually subject only to an up or down vote with no amendments allowed. The Omnibus Appropriations bill appropriates more money for the government than is favored by many, particularly budget conscious Members of Congress and the public, and the tax extenders bill will “cost” taxpayers over $600 billion, which is not being offset by savings in other government expenditures. Moreover, in the end, these big legislative packages are put together by the leaders of the two political parties in the Senate and the House, in consultation with the Administration. Often, even Committee Chairmen have limited input on the content of provisions that are in the jurisdiction of their committees. Both of these bills required bipartisan votes in both Houses of Congress. At public events this week, both Senate Majority Leader Mitch McConnell (R-KY) and House Speaker Paul Ryan (R-WI) stated that they believe 2016 will be an active year for legislating and that more legislation will follow the normal legislative process of being reported from congressional committees and then proceeding to consideration by both Houses, with differences being worked out in conferences. If this prediction from the leaders of both Houses of Congress proves to be correct, then there would likely be few, if any, “big bills” at the end of the next session of Congress, but there may be more legislation and public law enacted along the way. Throughout the past year, Republicans in the House and Senate have rallied behind provisions to prevent environmental regulatory initiatives of the Administration, as well as alter a wide range of Administration policies, including the immigration of Syrian refugees to the United States. To the Administration, the importance of having a veto-proof Senate was underscored in the negotiations between the President and the Congress and the two political parties, particularly to the Omnibus Appropriations legislation. With Republicans in the Senate unable to threaten realistically to obtain 67 votes to override a veto, the Administration was able to prevent many of the meaningful policy riders from being included in the legislation. Rather, the Republicans were able to obtain reduced appropriations for certain agencies, like the Environmental Protection Agency, and some general directives potentially restricting the rulemaking process, contracting and the formulation of new policy-level initiatives by the Administration. Taken together, the re-emergence of the ability of Congress and the Administration to agree on legislation, and the activist actions of the Administration on environmental policy, marks the beginning of a potential return to an active and interactive policy-setting agenda for the federal government. Whether a return to active governing is good or bad is debated daily in Washington, D.C. and in many parts of the country. What has become clear over the past year is that we have entered a time where legislating is emerging again, and federal policy setting by the Administration is testing its limits. The result is that those who rely on understanding where federal policies are going have found a new need to understand how policy is being developed in early 21st century Washington, D.C.
Van Ness Feldman’s lawyers and lobbyists have worked for decades in both the public and private sectors to create, impact, shape, implement, and comply with the nation’s major energy, environmental, natural resource, transportation, health care, tax, and other laws. The firm is recognized as a leader in Government Relations by Chambers USA and U.S. News/Best Law Firms. For questions regarding current and proposed policy developments, please contact any member of the firm’s Government Relations & Public Policy Practice at 202.298.1800.